Joel Goldsmith’s class work in Hawaii in 1959 was devoted exclusively to reintroducing the healing principles of the Infinite Way, which are essential to establishing a foundation for mystical living. 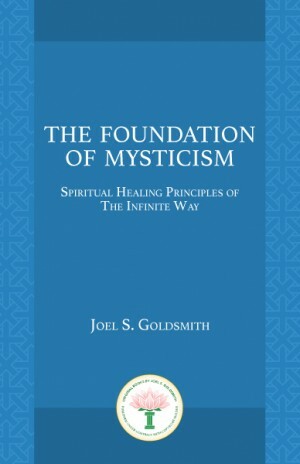 The Foundation of Mysticism provides edited transcripts of these important tape-recorded classes, which Goldsmith later referred to as the most significant material available to fully understand the principles and the practice of The Infinite Way. The Foundation of Mysticism is the fourth in a four-volume series of lectures that includes Rising in Consciousness, Consciousness in Transition, Consciousness Transformed and The Foundation of Mysticism. All four books present some of Joel Goldsmith’s lecture series. Rising in Consciousness and Consciousness in Transition illuminate his early class work, Consciousness Transformed records the last years of his work, and The Foundation of Mysticism is devoted exclusively to reintroducing the healing principles of the Infinite Way. Together the series presents a holistic overview of a living message. New students will find this classic book to be a valuable and complete introduction to the principles of The Infinite Way, while experienced students will benefit greatly from the fresh clarity with which Joel teaches the principles anew.